The Miriam Hospital is a private, not-for-profit hospital, with a history of providing superior patient care. It is the recipient of numerous clinical quality awards and has earned an outstanding reputation in the community. The hospital is staffed by more than 816 physicians, approximately 50 full-time house staff (medical school graduates), a nursing staff of 650 and more than 2,800 employees. The Miriam is a major teaching affiliate of The Warren Alpert Medical School of Brown University and is committed to being at the forefront of medical research. Our patients benefit from the latest in medical treatment provided by leading physicians who are training the next generation of doctors. The Miriam Hospital has received numerous distinctions and awards. It is certified by The Joint Commission as a Primary Stroke Center, and was the first in Rhode Island to be designated as such. The Miriam has received the American Heart Association/American Stroke Association’s Gold or Gold Plus designation for stroke care every year since 2008. The Center for Bariatric Surgery at The Miriam Hospital has been a Center of Excellence in Bariatric Surgery and was reaccredited in 2017 by the American College of Surgeons (ACS) Metabolic and Bariatric Surgery Accreditation and Quality Improvement Program (MBSAQIP). The Total Joint Center at The Miriam Hospital is recognized by The Joint Commission with a Gold Seal of Approval for its total knee and total hip replacement programs. The Miriam Hospital has earned the prestigious Magnet Recognition for Nursing Excellence and is one of the very few hospitals in the world to receive Magnet designation continuously for over 20 years. In March 2019, The Miriam Hospital was named among the Top 100 Hospitals in the nation, under the "major teaching hospitals" category, by IBM Watson Health. The hospital has been ranked multiple times as a top regional hospital by U.S. News & World Report, most recently in 2018. 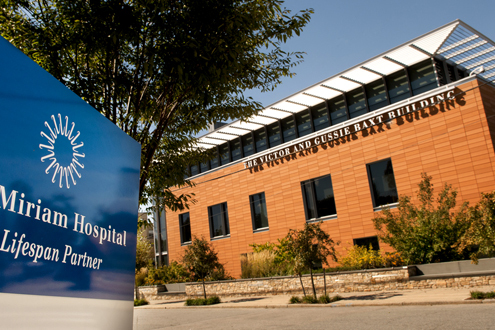 A founding partner of Lifespan, The Miriam Hospital is a comprehensive health care system providing accessible, high-value services to the people of Rhode Island and southern New England. Lifespan partners include Rhode Island Hospital and its Hasbro Children’s Hospital, Emma Pendleton Bradley Hospital, Newport Hospital and Gateway Healthcare. Throughout the years, The Miriam Hospital Association, now known as The Miriam Hospital Women’s Association, has played a major role in the development of the hospital. Their fundraising efforts and volunteer programs have channeled a network of resources, providing invaluable assistance to the hospital and the community.